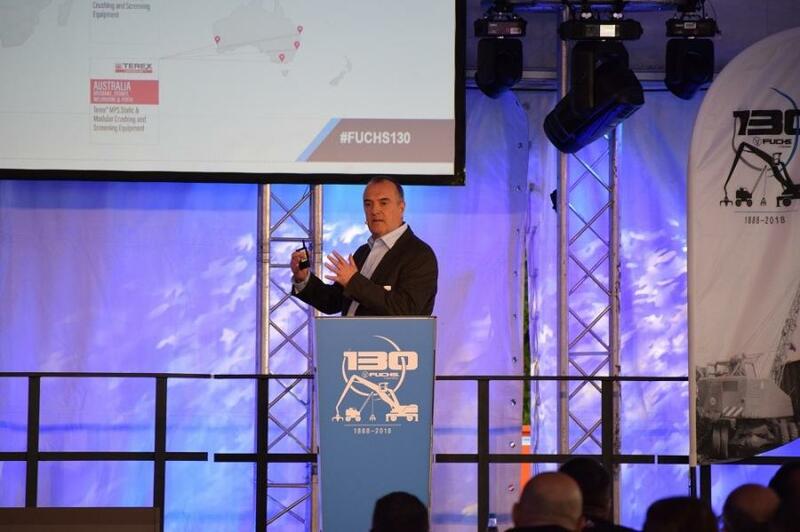 Kieran Hegarty, president Terex MP, gives an overview of Terex Materials Processing at the recent Fuchs 130th anniversary celebration. Terex Corporation reported third quarter 2018sales of $1.2 billion, up 11 percent versus Q3 of 2017, with increased sales and backlog in its AWP and MP business segments. The results were driven by continued implementation of the company's Execute to Win business strategy and its focus on meeting the growing needs of customers during a period of broad-based growth. The Terex Materials Processing segment delivered excellent performance across its portfolio of businesses with sales of $295 million that were 14 percent higher than last year. The growth was driven by global demand for crushing and screening products, material handlers and broad line of Environmental Equipment. Backlog for the segment at the end of Q3 was $446 million, up 72 percent versus last year. "We continue to see strong global demand for our products. We increased sales, bookings, and backlog in the quarter," said John L. Garrison, Terex chairman and CEO. "We continue to implement our Execute to Win priorities. We are seeing benefits from our Commercial Excellence initiative positively impact customer experiences and our market performance. At the same time, we are executing plans in Strategic Sourcing and Lifecycle Solutions that are designed to significantly improve future performance." Kieran Hegarty, president Terex MP, said, "Materials processing is a high-performing segment that consistently meets the needs of its global customers. Our businesses continue to focus on introducing new products and enhancements designed to address specific customer needs. We see the benefits in our increased sales, bookings and backlog. With 72 percent higher backlog, we look forward to a strong fourth quarter and expect to hit the ground running in 2019." For more information on Terex Corporation's third quarter 2018 results, visit https://investors.terex.com/investor-relations/press-releases/press-release-details/2018/Terex-Announces-Third-Quarter-2018-Results/default.aspx. For more information about Terex MP products and services, visit: www.terex.com/en/materials-processing.